Stool heights come in a range of sizes and types to respond to a variety of functions and uses. 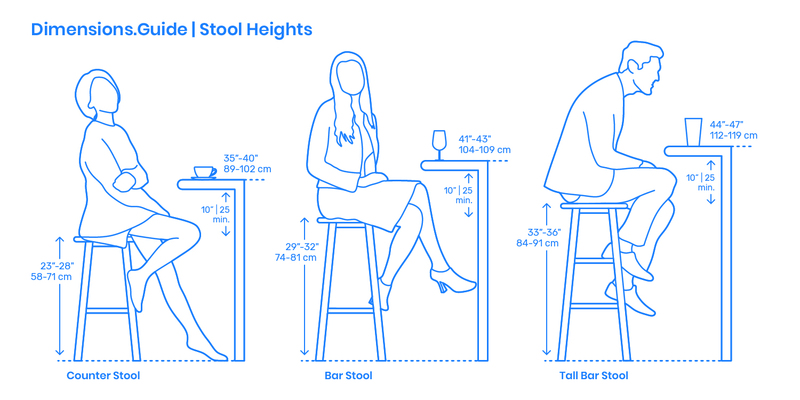 The most common variants of stool heights are counter stools, bar stools, and tall bar stools. Counter stools range from 23”-28” | 58-71 cm, bar stools from 29”-32” | 74-81 cm, and tall bar stools from 33”-36” | 84-91 cm. A minimum of 10” | 25 cm should be sized and provided between the top of stool seat and the underside of any counter to provide adequate space for the user.